There has been a face-off between Vietnamese fruits and improted ones because Vietnamese people are spending millions of dollars buying imported agricultural products with the believe that overseas fruit are of better quality. Vietnam mainly imported apples, oranges, kiwis and cherries from New Zealand and Australia, mangoes, custard apples, and tamarind from Thailand, green apples from the United States and vegetables from China. By the end of last November, the Southeast Asian country spent $1.6 billion on buying foreign fruits exceeding the previous year (with $1.5 billion). Of the amount, $722 million, $226 and $80 million were for buying fruits from Thailand, China and the United States respectively. Director of Vina T&T group Nguyen Dinh Tung said demand of imported fruits is high because people suppose foreign fruits are safer. 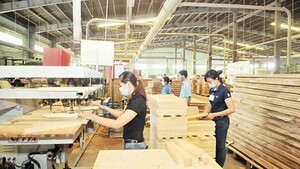 The Agro Processing and Market Development Authority (AgroTrade) under the Ministry of Agriculture and Rural Development (MARD) said that foreign fruits will flood Vietnam’s market more after the Vietnam- Europe Free Trade Agreement (FTA) and the Comprehensive and Progressive Agreement for Trans-Pacific Partnership (CPTPP) come into effect. Fruits from European countries and the United State are imported legally into Vietnam with clear indication of origin; accordingly, they are sold at high price. Specifically, New Zealand’s yellow kiwi fetch VND190,000 per kilogram and Envy apple at 235,000 per kilogram. Prices of cherry fluctuate at VND350,000 to VND1 million a kilogram in Ho Chi Minh City and Hanoi. Online shops also showcase imported fruits. Consumers used to be agog with Japanese violet grape Akebi which a facebooker proposed at VND380,000 a fruit weighing 300 gram or VND1.45 million a container weighing 1.5 kilogram. In addition to fruits of cold countries into Vietnam, familiar fruits such as durian, rambutan, tangerine, purple mangosteen which are grown in provinces countrywide are imported from Thailand, Indonesia, India, Malaysia, and China because they are very much in favor. According to a representative of Thu Duc wholesale market in HCMC, more than 631,000 tons of fruits have been transported in the market by the end of November. There has been a surge in fruits from the US, Australia, New Zealand, Japan and a drop in Chinese fruits which make up 10 percent of total veggies. The representative added that because Chinese fruits are illegally so it is not safe; hence, consumers do not prefer them anymore. One thing more is that foreign fruits is imported into Vietnam and then re-export to China. In 2017, nearly $0.9 billion imported veggies, durian, and purple mangosteen from Thailand was brought into Vietnam and then re-exported to China accounting for one fourth of total export revenue. Apart from that, in five first months of 2018, Thai fruits made up 15 percent of Vietnam’s $1.6 billion vegetable export revenue. Head of the Southern Horticultural Research Institute (SOFRI) Nguyen Van Hoa said that locally grown purple mangosteen are not favored because of its ugly appearance though it taste is very good. Vietnamese fruits are exported to 60 nations and territories yet exporters just pay attention to foreign market whereas they neglect local market. Director Tung said that Vietnamese fruits are favored by overseas consumers but they are not chosen by Vietnamese who prefer safe fruits. Vina T&T Group is a pioneer in selling locally grown fruits by opening its first retail outlet in Phu Nhuan District in the middle of 2018. The group plans to open more shops to sell Vietnamese fruits. Director Tung said that it is illogical when Vietnamese people pay high for imported fruits while organic locally grown fruits are for exports. Very a few retail shops sell local fruit while series of outlets of overseas fruit have been mushrooming in big cities nationwide. The group stores will sell best Vietnamese fruits to compete with its oversea kinds. Presently, Vina T&T Group possesses vast farm lands in the Mekong delta and three fruit processing plants in Ben Tre and Tien Giang provinces where rambutan, mango, durian, coconuts are grown.